We hosted our 7th annual 4th of July party last night and it was a huge success! 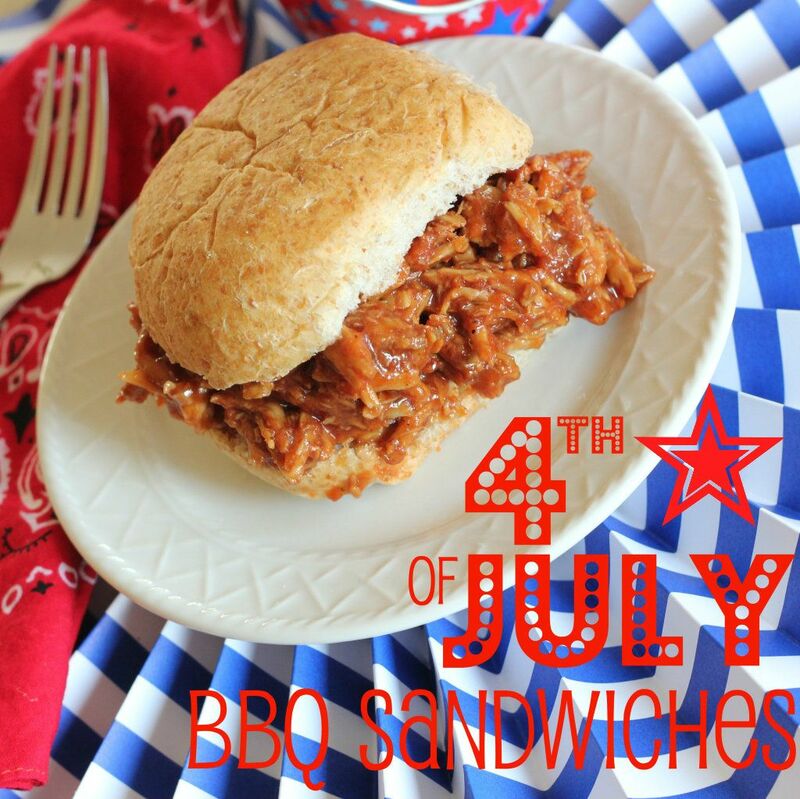 Our homemade pulled pork BBQ sandwiches are always a crowd-pleaser and this year was certainly no exception. I made a huge batch, thinking we’d have plenty leftover to enjoy throughout the rest of the week – but it was gobbled up faster than a firework! I roasted up a 10 pound pork loin (pictures of that huge sucker on my Facebook page) on Saturday. That night our power went out (due to the heat) so I had to shred it up by candlelight! This took forever, of course, but as long as you do have power you can save yourself a ton of time by using a hand mixer (or KitchenAid mixer with a paddle attachment) on low to shred your pork in just seconds! On Sunday I simmered up some homemade BBQ sauce, stirred in the shredded pork, and refrigerated it until the day of our party when I let it simmer on low in my Nesco roaster for a few hours prior to our party starting. The key is to give this sauce plenty of time to simmer so the flavors marinate and develop – it’s worth it! 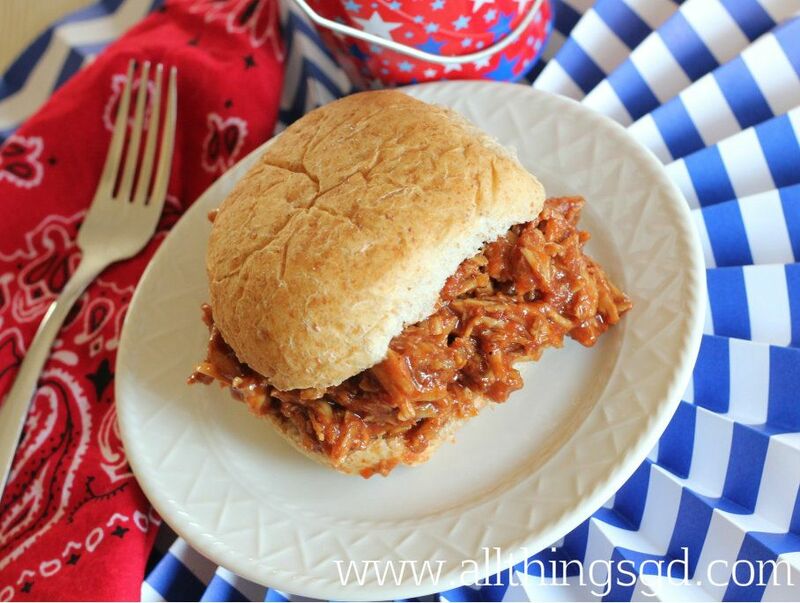 This pulled pork BBQ sandwiches recipe (adjusted from this source) makes enough to feed a party of about 40 hungry people. We had 30 adults and 20 children (most of them around 2 years old) at our party and the pan was scraped clean! Serve this at your next summer party and it’s sure to be hit! That looks delicious D!!! Pinning this one for when I am feeling adventurous! This is making my mouth water! YUM! Oh girl! Put those forks down! If you have a kitchenaid mixer, just use that to shred the pork! Use a paddle attachement and “mix” a chunk of pork on low-med until its shredded. It works AWESOME! looks SO good! i “like” your facebook page, but i never get your posts on my feed. i hate how funky it’s being. i went and “liked” the post just now so hopefully i will start getting them in the future. happy 4th! @Chrissy: Yet another reason why I need a Kitchenaid mixer! I didn’t know it could do that. That’s incredible! @Lindsay: I recently read that you need to be active with a page (by liking or commenting on it) to continue seeing it in your feed. I’m not a fan of that change AT ALL. I like to see ALL of my pages that I like; it’s so frustrating when they disappear from my News Feed and I don’t even realize I’m missing things. Grrr. Thank you for your “like” and for following along! Looks great. I think I’ll be making this for our next bbq. That looks so yummy!!!! Adding that to the recipe book for sure. Thanks for sharing. Sounds delicious! And I’m sure shredding it by candlelight wasn’t an easy task! You poor thing! looks amazing…must try the recipe. i would love to make this. what in the world is unsulfured molasses? Is it just regular molasses? Where can I find it in the grocery store? Syrup isle??? @Anonymous: I can’t remember where I found it, but the syrup aisle would be a great start! Just look for molasses and see if it says “unsulfured” on the label. My jar has the word large and at the very top so I’m guessing it’s a rather common thing. Good luck!